Gluten-free garlic bread recipe. It’s low-carb and keto friendly! Try this Gluten-Free Garlic Bread it’s delicious and as doughy as normal bread should be, with an aromatic yeast to entice. Also low carb, keto and paleo friendly. 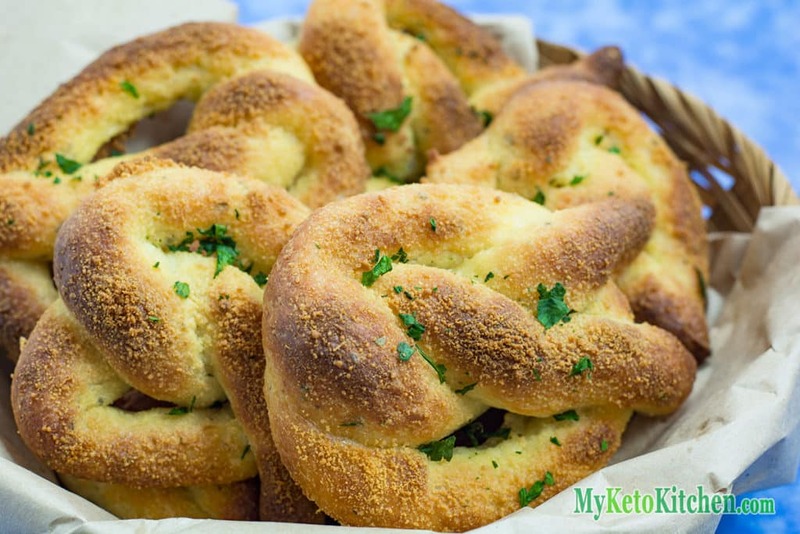 This gluten-free garlic bread recipe is an adaptation of our keto pretzels recipe. Serve them piping hot – fresh from the oven with a big knob of butter. Our gluten-free garlic bread makes the perfect side for our Creamy Mushroom Soup. This recipe makes 12 serves. 1 serve is 1 keto garlic bread pretzel. Gluten-free garlic bread can be stored in the fridge for up to a week. They can be eaten cold or warmed in a microwave or oven. In a heatproof bowl, place the mozzarella cheese and 4 tablespoons of butter. Place in the microwave until completely melted & pourable. Or melt in a saucepan on the stove. Add the yeast to a second mixing bowl and pour over the warm water. Add the almond flour, xanthum gum, garlic powder, salt, and oregano. Mix well. Add the eggs and lightly mix. Add the melted cheese and butter mixture and mix well. When to dough is cool enough to handle, put on food-safe disposable gloves and knead until all ingredients are combined. Split the mixture into 12 evenly sized balls. Roll each ball into a long sausage and twist into a pretzel shape. Once all the gluten free garlic breads have been rolled, brush them with remaining tablespoon of melted butter and sprinkle over the parmesan cheese. Bake in the oven for 15-20 minutes, until the pretzels are golden brown and the edges are firm. Allow sitting for 5 minutes before enjoying! 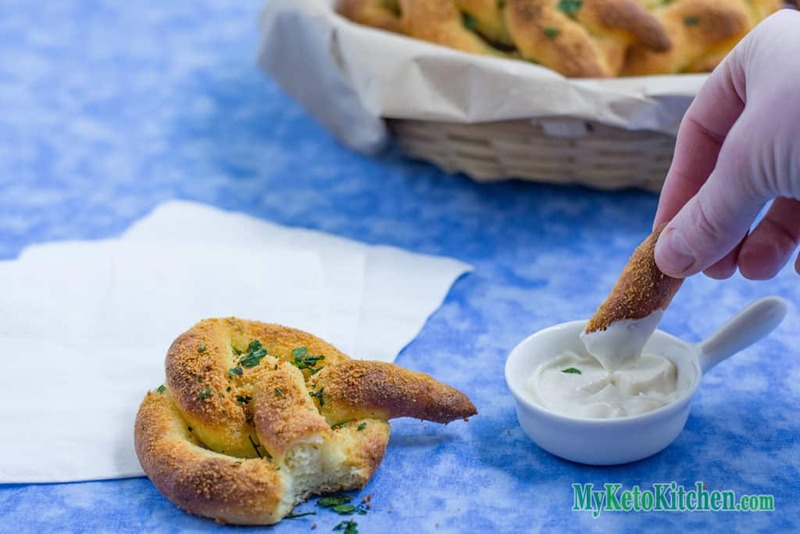 Enjoy the gluten-free garlic bread pretzels as they are or serve with Roast Garlic Aioli. Prefer a sweet bread-like treat? Our Glazed Donut Pretzels are just the tasty treat you need! 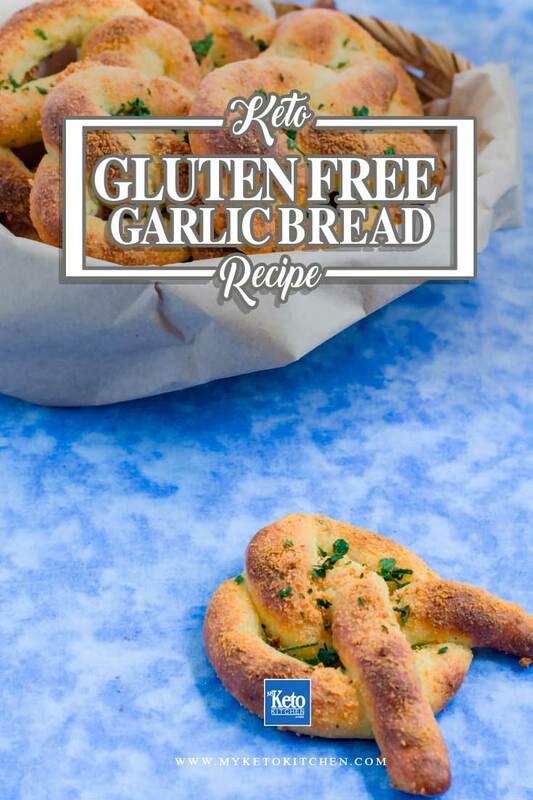 Our Gluten-Free Garlic Bread Pretzels with Parmesan Cheese are the perfect replacement for the original and an excellent side to soups and main meals. Add the yeast to your mixing bowl and pour over the warm water. Add the almond flour, xanthum gum, garlic powder, salt and oregano. Mix well. Once all the pretzels have been rolled, brush them with remaining tablespoon of melted butter and sprinkle over the parmesan cheese. Bake in the oven for 15-20 minutes, until the pretzels are golden brown and the edges are firm. Allow to sit for 5 minutes before enjoying! Enjoy the pretzels as they are or serve with Roast Garlic Aioli. 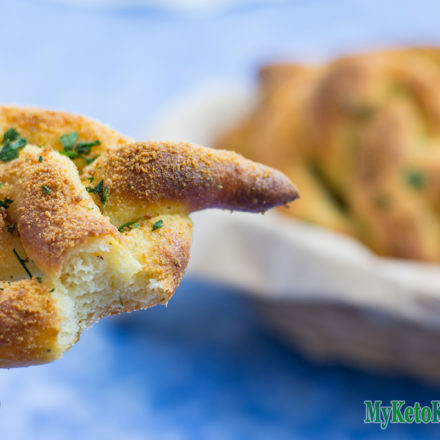 To make a larger batch of this Gluten Free Garlic Bread recipe adjust the servings above. Keto Scrambled Eggs – Low Carb Breakfast – Easy Healthy Start To The Day!